Hi Guess The Emoji is the latest Hi Guess game. You get a series of 2, 3 or 4 emojis and you have to determine what they represent. It could be a brand, a saying, a movie, or any other commonly used phrase. If you are here, you're probably looking for the answer to a level. Find the one you're stuck on by using the page navigation, either buttons or graphics and click the screenshot to reveal the answer. 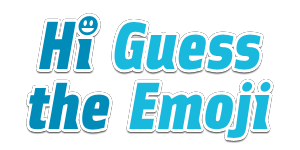 Hi Guess The Emoji Answers | Hi Guess The Emoji Cheats This site is not endorsed by or affiliated with CamMax.